Built in the 13th century, Grenoble Cathedral underwent extensive rebuilding in the nineteenth century and more recently in the 1990s. The Cathedral is part of a complex of historic buildings which includes the former bishop’s palace, Saint-Hugh’s church, and the remnants of a fourth century baptistery which is accessible from the nearby bishop’s palace museum (Musée de l’Ancien Evêché) at 2 rue Most Cloisters. 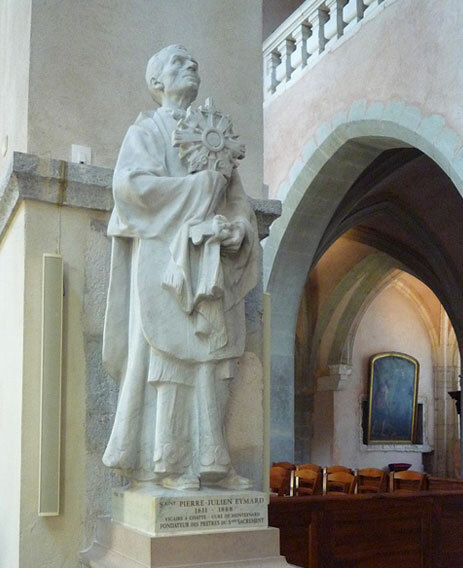 A large statue of St Peter Julian Eymard holding a monstrance is located inside Grenoble Cathedral, opposite a statue of the Curé of Ars (St Jean-Marie Vianney). After a failed attempt in 1829 to join the Oblates of Mary Immaculate at Saint-Just near Marseille, Eymard retained his desire to become a priest. But his health was poor, his parish priest thought he was ‘lacking in spirit’, and his dying father had wanted him to take over the family business. In 1831, soon after his father’s death, Eymard put his past behind him and set out from LaMure with intentions of entering the diocesan seminary at Grenoble. 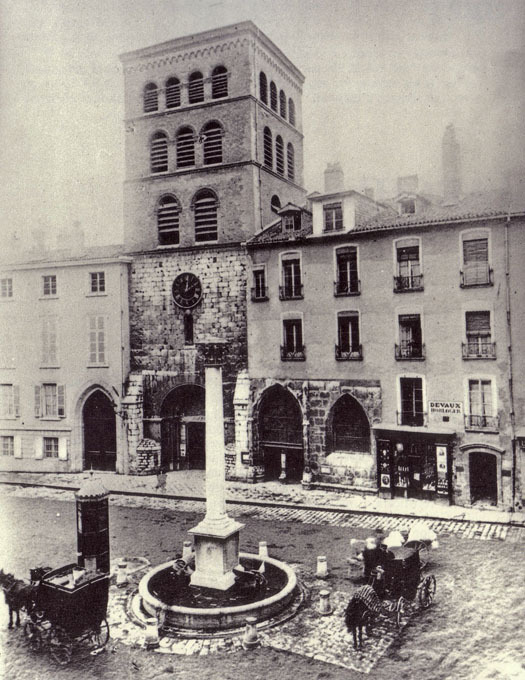 On reaching Grenoble, Eymard went to the cathedral to pray. At the entrance he met Eugène de Mazenod, the influential founder of the Oblates. Eymard had known de Mazenod during his brief period at Saint-Just in 1829. De Mazenod agreed to take up Eymard’s cause and subsequently intervened to ensure that Eymard was admitted to the seminary. This meeting of Eymard and de Mazenod at Grenoble Cathedral is an example of how Eymard’s journey was seemingly blessed by extraordinary or providential circumstances at critical points in time. When Eymard set out from La Mure to Grenoble he was, as the biographer Donald Cave has said, ‘without recommendation of any sort’. Eymard was obliged to begin his journey in darkness and in faith. 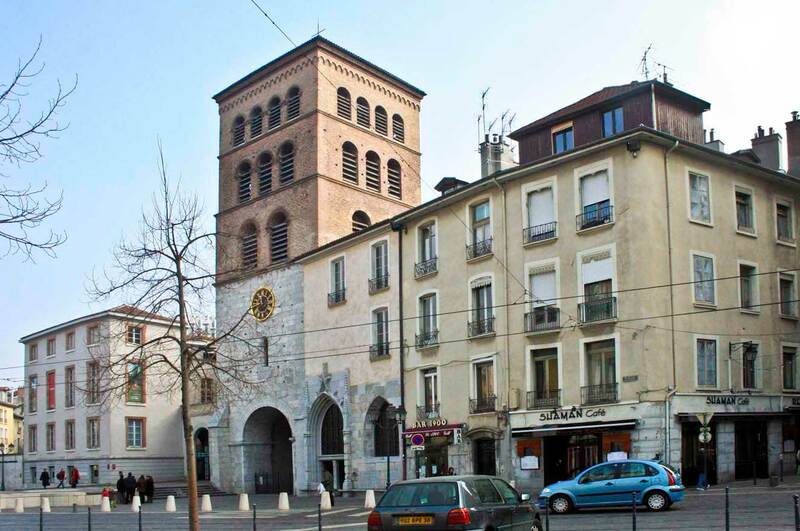 Grenoble Cathedral is significant for its close association with the two priest-saints: Peter Julian Eymard and his friend the Curé of Ars Jean-Marie Vianney (now the patron saint of priests). Both men were ordained in the Diocese of Grenoble and are commemorated by statues in Grenoble Cathedral. A third great priest, of more recent times and not yet canonised, is also directly associated with this cathedral. Henri Groues (1912-2007), better known as Abbé Pierre, was a curate at Grenoble Cathedral during the Second World War in 1942, when he was active in the Resistance movement and in hiding Jews from persecution. Like Eymard, who had ministered to the ragpickers of Paris, Abbé Pierre identified with all who were marginalised or oppressed. His legacy is the international human rights movement ‘Emmaus’.